(Arachnura melanura), also known as black tail spider and drag tail spider is a species of spider in the family Araneidae. It ranges from India to Japan to Sulawesi. It camouflages itself by mimicking dead leaves and twigs to lure its prey. Specimen origin: Pueblo de Panay Wild Reserve. 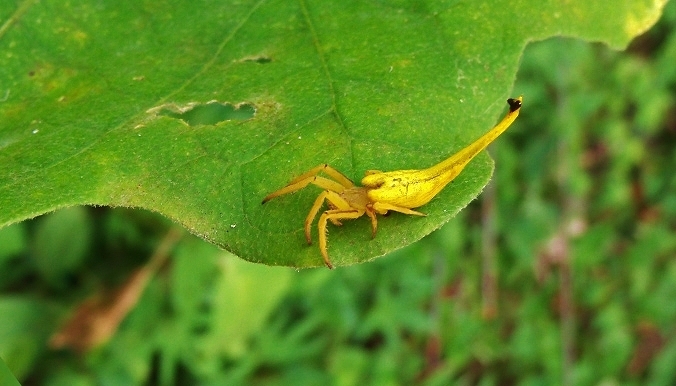 The yellow colored spider of this species are quite normal or common. My daughter and I discovered two more morphs of this species. An albino and a reddish brown with red bands on both sides of its body. We think they are special and rare morphs so we brought home some to introduce to our garden for further observations. may your tribe increase, john and shekainah alaban. philippine society needs more people like you to bring appreciation on the richness and beauty of nature. Hello John. I really am interested in these three different morphs. I would like to ask for your permission to include these photos in my coming field guide on the spiders of SE Asia. I have include about 400 common species in our region. I am a scientists and the professional photographers are based in Malaysia and Singapore. Please feel free to drop aline at my email at pakawin @ gmail. com Thank you.